Will OPEC+ cut production once again? US sanctions against Iran came into effect on the 5th November, yet offered little in the way of support to the market, with participants having had plenty of time to price in the impact already. However, the markets were focused on the countries who would receive waivers, and what volume was covered over the 180 day waiver period. With the exception of Italy and Greece, there were no real surprises. 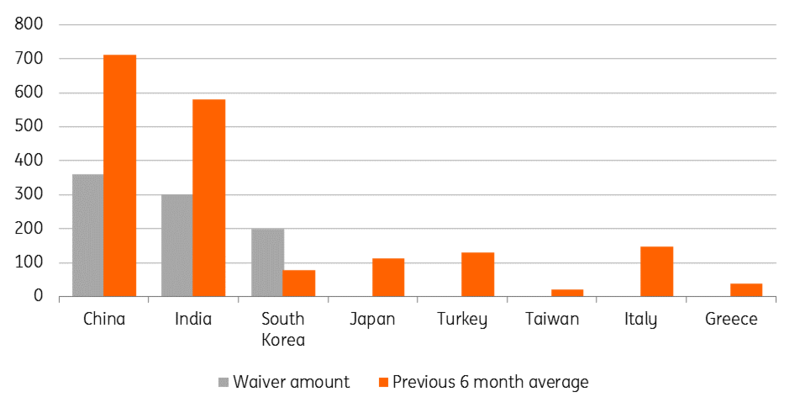 China, India, Japan, South Korea, Taiwan and Turkey are the remaining countries who managed to secure waivers for the next 180 days. In October, these eight importers made up for around 75% of total Iranian exports. However what the market is really interested in, is the volume these waivers allow each country to import. Media reports suggest China secured waivers for 360Mbbls/d, while India is allowed to import 300Mbbls/d and South Korea a total volume of 200Mbbls/d. As for the other countries, there is little clarity on volumes yet. 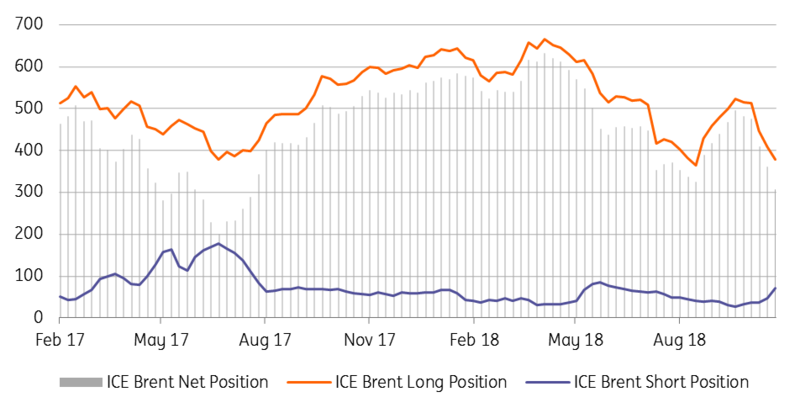 In recent weeks, speculators have significantly reduced their net long position in Brent, by liquidating about 200k lots of their net longs since early October. Growing supply, broader macro concerns, and the shrinking backwardation have all clearly contributed to this move. However, this does leave speculators with quite a bit of room to increase their long positioning moving forward. The long/short ratio also suggests that speculators are currently holding a rather neutral position, with the ratio currently standing at around 5, as opposed to over 20 earlier in the year. However, to see speculator longs enter the market once again, we would need an appropriate catalyst. At the moment, the most obvious catalyst is noise around OPEC and Russia discussing potential cuts in 2019. Concerns over whether OPEC nations would be able to make up for Iranian shortfalls have clearly eased, evident by the pressure we have seen on Brent since early October. While October secondary output numbers are yet to be released by OPEC, Bloomberg estimates show that the group’s output increased by 430Mbbls/d over October to reach 33.33MMbbls/d - the highest level seen since November 2016. If OPEC reports a similar number, this would mean that output has increased by 1.2MMbbls/d since May. 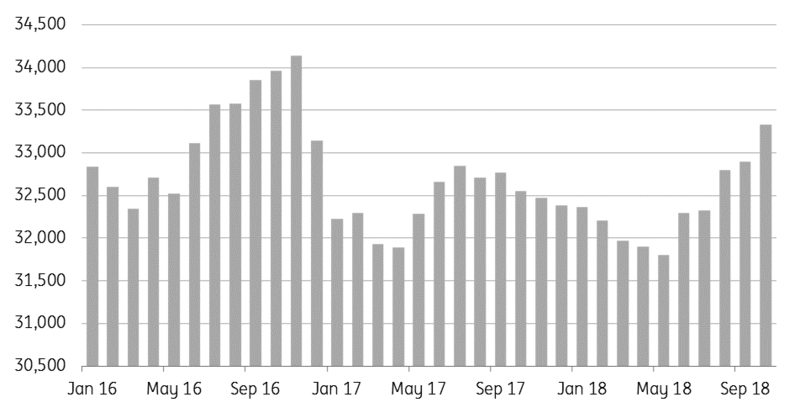 No surprise that Saudi Arabia made up the bulk of this increase, with output increasing by close to 700Mbbls/d since May. Russia has also done a good job ramping up its output, with production averaging a record 11.41MMbbls/d over October, up 40Mbbls/d MoM, and significantly higher than the 10.97MMbbls/d produced back in May. Price weakness has raised the prospect of OPEC+ reversing their recent policy of producing as much as they can, to one where they show more restraint. 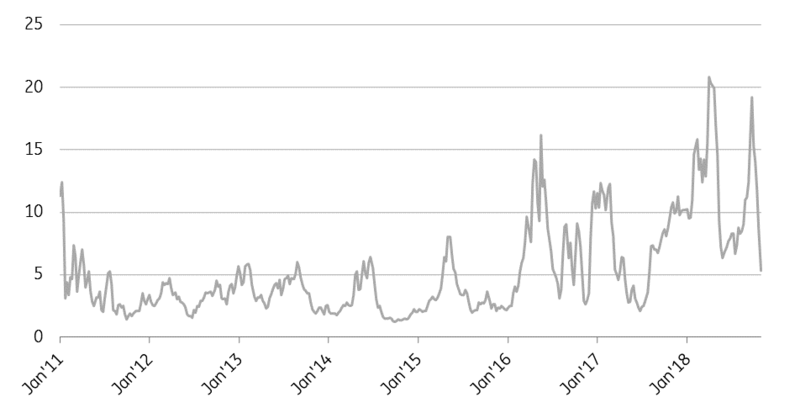 Already this week there has been increased noise that OPEC and Russia could look to potential production cuts over 2019. This weekend will see OPEC members meeting in Abu Dhabi for a Joint Ministerial Monitoring Committee (JMMC) meeting, where the possibility of cuts or at least limiting output increases will be on the agenda. If any cuts are to be introduced, we believe that they will be much more limited in scope. Our balance sheet shows that the global market will be in surplus over the first half of 2018, and so if OPEC was to intervene, there is the possibility that they try to limit any cuts/freezes to a six month period. Further cuts from OPEC+ would likely draw criticism from key consumers. 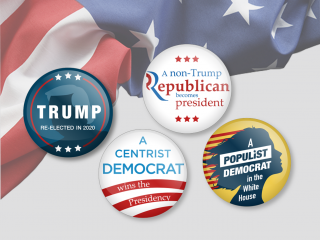 However, the US may not show as much concern this time around, given that the mid-term elections are now behind us. 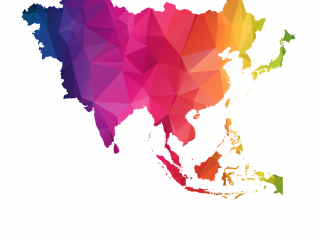 However key emerging market consumers are likely to continue to show their discontent at potentially higher oil prices, coupled with a stronger USD. India stands out as a prime example, with the rupee depreciating around 15% year to date. Meanwhile, the country has general elections over 2019. Recent developments in the US market have certainly not helped the oil market. We have seen consistent builds in US crude oil inventories, in fact over the last seven weeks, US crude oil inventories have increased by a rather impressive 37.65MMbbls, which has taken US crude oil inventories back above the five-year average, and also weighed heavily on WTI spreads, with the front end of the curve in contango. We don't think these builds will persist for much longer, as refiners will be returning from the maintenance season in the coming weeks. As we see a pick up in run rates, this should start to offer some support to the market we believe. Monthly production data from the EIA shows that over August, US crude oil output averaged 11.35MMbbls/d, much larger than the 10.98MMbbls/d suggested by weekly production estimates. In fact, over August, the US was the largest crude oil producer in the world, with its output surpassing Russia. The supply pressure does not stop there, in the EIAs latest Short-Term Energy Outlook, they revised higher their 2018 US oil production forecast from 10.7MMbbls/d to 10.9MMbbls/d, which would be a 1.5MMbbls/d increase from 2017 levels. 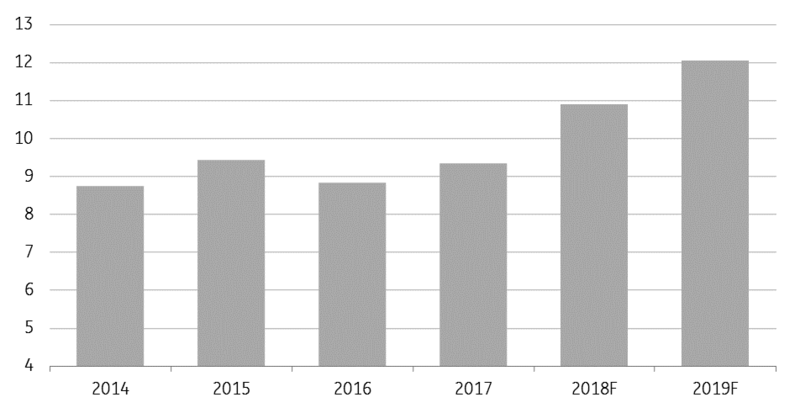 Meanwhile, the EIA also took the opportunity to revise higher their 2019 production forecast from 11.8MMbbls/d to 12.1MMbbls/d. Although pipeline constraints may be an obstacle in achieving this number, with significant pipeline capacity out of the Permian only expected to come online over the 2H19.